Vintage + Contemporary = Steampunk! If you had asked me four months ago to describe Steampunk I would have answered with a blank stare. I had NO idea that this was an art form let alone one that is quite unique, intriguing and most of all taking the design world by storm! 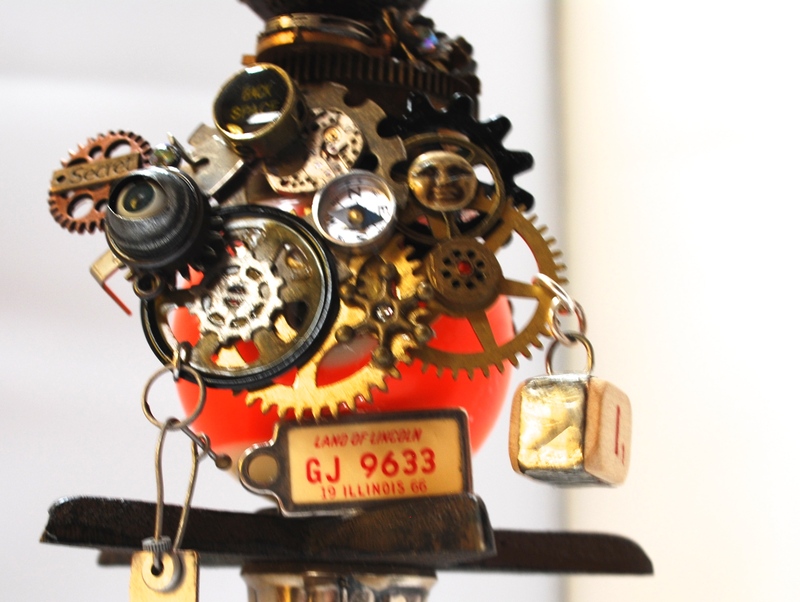 In essence, Steampunk is the melding of vintage objects with a contemporary flair. How can I best explain Steampunk – well think of taking your grandmother’s glass trinkets and placing it with your father’s baseball. Glue them together and add a bunch more interesting novelty pieces. Hard to visualize this as art? I had a difficult time wrapping my head around this, too. To get some clarity I did some homework and found myself spending a bit of time with someone who could answer a whole bunch of questions about Steampunk – Beverly Holman, a longtime resident of Hermosa Beach, CA. First lesson I learned – 80 is the new 50! Despite being a senior citizen she is no way near retiring, as she has jumped in with both feet and wizardry hands to create the most funky of designs! Imagine placing an eyeball and a license plate on to an old camera. Strange grouping you may think? Well look below and see how this odd matching of objects becomes a work of art! Look at the intricate details! I had an opportunity to interview Beverly and found out that after many years in behind a desk she longed for her first love – art! Without much ado, once retiring she decided turn back time and go back to her artistic roots. She decided to start by seeking out various retro and antique items that could be repurposed. (Her house is stacked with bins that hold the most fascinating collection of objects!). Once she has mapped out a general idea she assembles items that she believes will carry out a chosen theme – then she sits down and starts to create! Hours and days later a new Steampunk design is born! Here is where I get sad – I see these wonderful creations and then reflect back to the many times I threw out little objects thinking they were were worthless. Who would want that odd monopoly piece or glass figurine from a five and dime store? Beverly does! So if you are sporting an AARP card and wondering what to do in the next chapter of your life – consider your more creative side! Nothing keeps a brain and body fresher than setting goals and using your innate talents! And, if you are interested in learning more about Steampunk or wish to have a great conversation with a fascinating woman please check out Beverly’s website! I am glad I did! Below are some photos I took of just a few of the dozens of creations that Beverly has made. Many of her designs are available on ETSY and in California shops – a list is on her website with links. Enjoy and note – I truly love Steampunk and was fascinated by the art form. This is NOT a sponsored post.